These cookies came about when my three year old woke up one morning asking for “chocolate cookies”. ha! I wanted to find a way to make a healthier chocolate cookie for him to enjoy. 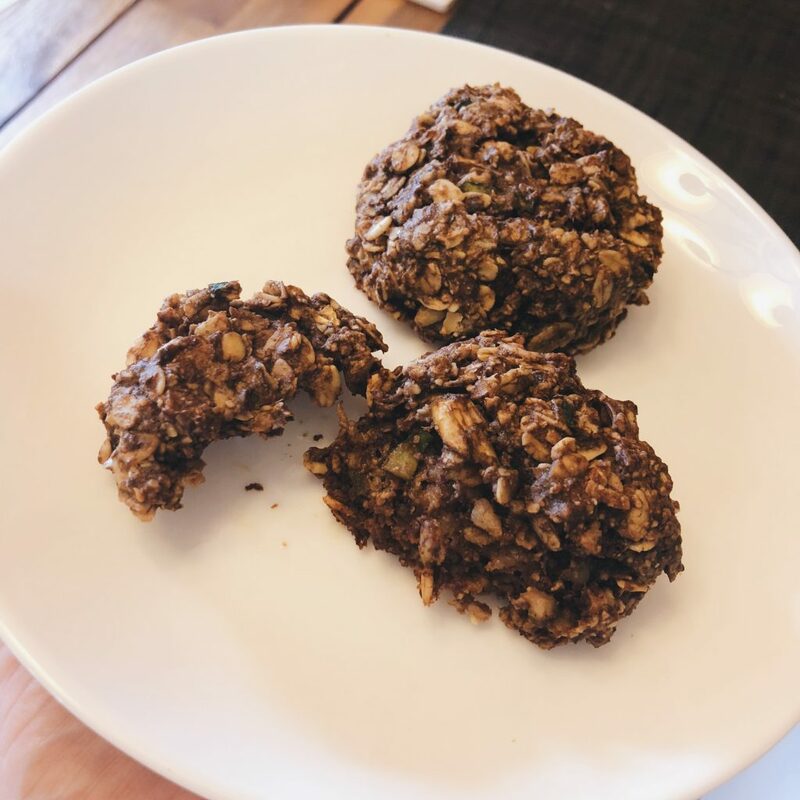 We both love breakfast cookies made with oats and I’ve been on an almond flour kick lately so that’s what I started with! I also wanted to use up some in season zucchini I had in the fridge. You could do chocolate chips (my son’s preference) but I was all out and wanted to avoid refined sugar so we just added cocoa powder. Bananas help sweeten these along with a little maple syrup. A little tip for almond flour… It can be pricey to purchase so I always make my own. I buy almond in bulk and simply grind them (in my Vitamix or food processor) until they resemble flour! I like these raw ones from Amazon. These cookies are chewy, with good texture. 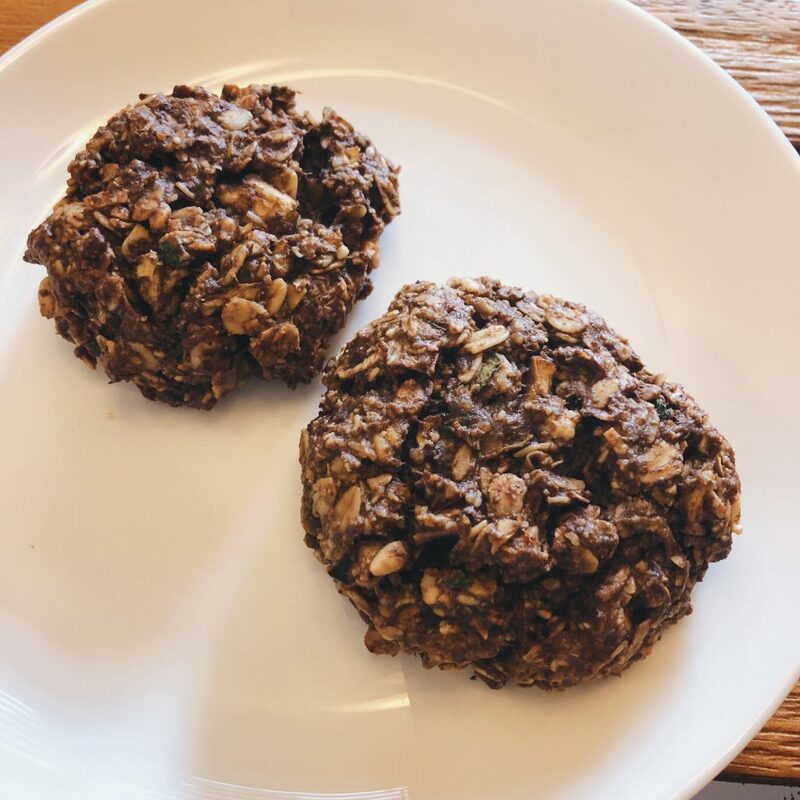 They’re full of vitamins and minerals thanks to the almonds, oats, zucchini, flax etc and aren’t too sweet! Cocoa does contain a little caffeine so I’d limit how many you let your toddler eat hehe but it is full of nutrients! 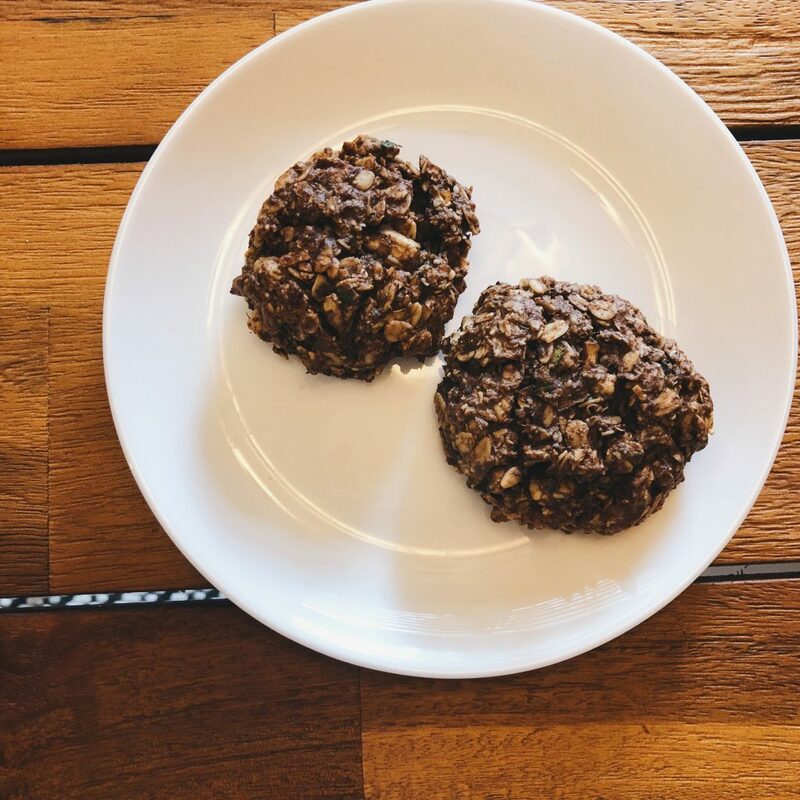 These cookies are gluten free, vegan and packed with nutrients! Very little sugar makes them a great morning treat. Make your flax egg in a small bowl and let sit while combining the other ingredients. In a large bowl, mix together the almond flour, oats, baking soda and cinnamon. Mash your banana and then add it to the dry mixture along with the unsweetened coconut flakes zucchini, pure maple syrup, coconut oil and cocoa powder. Add in the flax egg and stir well to combine. Let the mixture sit for 5-10 min to soak up some moisture. Add ice cream sized scoops to a greased baking sheet. I like to form them into a bowl in my hands and then gentle press them down on to the sheet. The mixture will be a bit sticky but they won't spread when cooking. Bake at 350F for 15min and then let cool completely on the baking sheet. Store in an airtight container for 2 days or in the fridge for 5 days. You can make your own almond flour by grinding almonds in a food processor or Vitamix. You can shred zucchini with a cheese grater, in a food processor or in a Vitamix.